A while back marhaba guest services held a large scale competition, inviting participants to submit their wishes for a chance of them coming true. Vinod is an Indian expat living in Dubai. He has a wife and two children back in Ahmedabad, India. He nearly lost his wife as she had kidney failure. His mother-in-law donated a kidney which has given her a new lease on life. Vinod loves his wife very much and wanted to show this to her by surprising her. When they first met on Valentine’s day he gave her a red rose, now he has taken things to a new level with the help of marhaba. 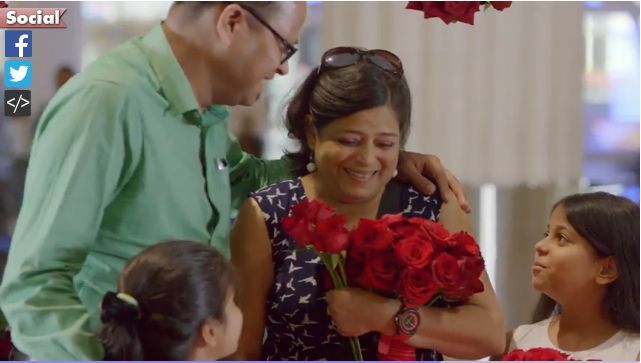 A shower of red roses awaited his wife as she arrived to Dubai’s airport- to help set the romantic mood a violinist was also present playing soft tunes.